Tippmann is excited to launch a new .50 Cal marker. The FT-50 utilizes the same design of the popular FT-12 with a flip top, tool-less design but with new internals and barrel for .50 Cal games. There are many advantages to .50 cal games including a lower weight, less impact and less mess to clean. 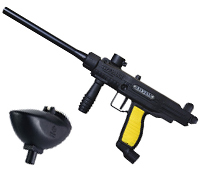 When the FT-50 is fully loaded with paint, the smaller hopper still carries over 300 paintballs but the overall weight is much lighter. It also provides a lower impact force that will appeal to younger players. The flip-top design makes rental maintenance easy and quick. Compared to .68 caliber paint, .50 caliber paint has lower cost, takes less storage space, and results in less paint to clean. All of these aspects of the FT-50 will ultimately contribute to the bottom line of a field. The FT-50 rental comes complete with a smaller .50 cal hopper and maintenance kit.